The origin of contesting can be traced to the Trans-Atlantic Tests of the early 1920s, when amateur radio operators first attempted to establish long distance radiocommunications across the Atlantic Ocean on the short wave amateur radio frequencies. Even after the first two-way communications between North America and Europe were established in 1923, these tests continued to be annual events at which more and more stations were successful in establishing two-way contacts over greater and greater distances. In 1927, the American Radio Relay League, which had been principal in organizing and publicizing these tests, proposed a new format for the annual event, encouraging stations to make as many two-way contacts with stations in other countries as possible. The 1928 International Relay Party, as the event was renamed, was the first organized amateur radio contest. The International Relay Party was an immediate success, and was sponsored annually by the ARRL from 1927 through 1935. In 1936, the contest name changed to the ARRL International DX Contest, the name under which it is known today. One of the best ways of getting the most out of your investment in amateur radio is to take part in contests. In South Africa we have numerous contests that mostly take place over weekends which gives you the opportunity to compete against your local peers. There are also plenty of overseas contests where you have an opportunity to test your skills against your international peers. Your level of intensity in these contests depends on whether you just want to take part for fun or aim on winning the contests. Why take part in contests? Everyone has their own reasons. Some of mine are: to sharpen my operating skills, to learn to get the most I can out of my equipment, to compete against my peers, to be a part of the community of contesters. The winner in each category is the station which gets the most points in that category. Each QSO will score a certain number of points. The number of points scored for a QSO may depend on the location of the station contacted - for example in the CQ Worldwide DX contest stations on the same continent as yourself count 1 point each, stations on a different continent count 3 points and contacts between two stations both located in North America count 2 points. In other contests, QSOs for certain stations may count for more points than QSOs with others - for example, in the ARRL 10m contest, contacts with stations holding Novice or Technician Plus class licenses count more than contacts with other license classes. In contests which allow you to work in different modes (for example, CW and SSB) the number of points may also depend on the mode. As well as getting points for each QSO, most contests allow you to get multipliers from certain QSOs. For example, you might get a multiplier for every different country ( DXCC entity) you work on each band during the contest. Your final score for the contact will then be calculated by multiplying the total of all your QSO points by the number of multipliers you worked. For example, if you worked 100 stations at 2 points per QSO and 20 multipliers, then your total QSO points would be 100 x 2 = 200, and your multiplier is 20, so your final score would be 200 x 20 = 4000 points. What is a DXCC Entity? 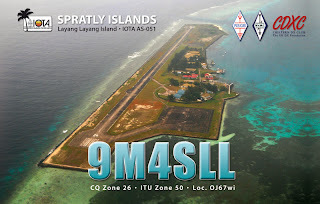 Entities correspond roughly to countries and administrative territories, but they also may be islands and even reefs if they meet criteria set by the ARRL, which administers the DX Century Club (DXCC) award and decides what qualifies as an "entity". What is a CQ Zone? The world is divided into 40 "CQ Zones" which are used as multipliers for some contests. Get further information and a map showing the different zones at www.cq-amateur-radio.com/wazmain.html. What bands can be used during contests? That depends on the particular contest. Some contests are limited so a single band - for example, the ARRL 10m contest is (not surprisingly) for 10m only. Many contests allow operation on all the pre-WARC HF bands - that is: 160m, 80m, 40m, 20m, 15m and 10m. Other contests are for VHF bands only. However note that contesting is never permitted on the WARC bands: 30m, 17m and 12m. This is so that amateurs who do not enjoy contesting can take refuge on the WARC bands during contests. What are the "WARC" bands? The WARC bands are the 30m, 17m and 12m bands. They were named after the World Amateur Radio Conference in 1979 at which these bands were allocated for amateur use. The WARC bands may not be used for contesting. Why are there different entry categories? Different contesters have different preferences and budgets. Some like to work on their own, others prefer to be part of a team. Some can afford high-power stations, others prefer to compete with a "barefoot" or QRP transceiver. By dividing a single contest into a number of different entry categories, all contesters can share the fun and contribute to the contest, while competing against similarly equipped stations in the same category. What sorts of entrance categories are provided? Single Operator High - a single operator, maximum power 1.5 KW, no DX alerting assistance (for example, DX cluster spots) allowed. Single Operator Low - a single operator, maximum power 100W, no DX alerting assistance allowed. Single Operator QRPp - a single operator, maximum power 5W, no DX alerting assistance allowed. Single Operator with DX Spotting Net (also called "Single Operator Assisted") - a single operator, maximum power 1.5 KW, passive use of spotting nets allowed. Multi-Operator, Single Transmitter (also called "multi single" or "MS" for short) - any number of operators, but only one transmitted signal allowed at any time. The additional operators will often be listening for new multipliers, and passing the information on to the one transmitter operator. Multi-Operator, Two Transmitter (also called "multi two") - Any number of operators, but only two transmitters. In CQWW, both transmitters may work any stations. In some other contests there are strict restrictions on what the second transmitter may do - for example, it may only be allowed to work new multipliers. Multi-Operator, Multi Transmitter (also called "multi multi") - Any number of operators, operating any number of stations, but with only one transmitted signal on each band at any time. In many cases a "multi-multi" station will have a dedicated transmitter for each of the contest bands. Note that in CQWW, single operator entries can choose to be all-band, or only to work a single nominated band. What do "SOLP", "SOHP", "SOAB", "SOSB", "M/S", "M/2" and "M/M" mean? What is the "DX Cluster"? It is a worldwide computer system on which DX stations are reported ("spotted"). It can be accessed via Packet Radio or on the Internet at www.dxsummit.com. You are only allowed to make use of DX Cluster spots if you are entered in an "assisted" class. No matter what class you are entered in you may not enter your own station into the DX cluster, this is called "self spotting" and is illegal in all contests. Do I need a computerized logging program? To make a serious attempt at an international contest, yes. Most of the smaller stations that enter a contest spend much of their time answering other stations that are calling CQ. This is known as "search and pounce" - you search for a station you need, and then pounce on it by replying to its call. However since you can only work a station once on each band and mode, before you reply to the CQ, you need to know whether you have worked the station before, and unless you have a photographic memory a computer logging program is by far the best way to do this. Contesters are a very friendly bunch, but calling the same station five or six times on the same band during a major international contest will test the patience of even the most saintly participant. Of course if you are fortunate enough to be even moderately rare DX (ZS for example), then you can get by with calling CQ yourself and waiting for a reply, log this on paper and later remove the duplicates ("de-dup" the log) by hand. This is what I did in my first major contest, but after manually de-duping 475 QSOs, which took me a whole day, I went out and bought a logging program. Note that for many of the smaller state or national contests, you can get by without a logging program as there are few enough entrants that you can remember who you have worked or look it up on your paper logs. These contests can be great fun and are excellent practise for the "big ones". What logging program should I get? There are many different, some commercial ones, which you have to pay for, and some which are free. Popular commercial programs include WriteLog for Windows, TRLog and SD. Writelog has a Windows graphical user interface. Although originally written for DOS, TRLog will also run under most versions of Windows. SD is available in two versions, one which runs character-mode under Windows, and one for DOS. Free contest logging software includes CT, also originally designed for DOS, and the open-source N1MM logger for Windows. N1MM has been adopted by the SARL as the logging software that is recommended. N1MM is the only logging program that has all the templates for our contests included which makes it a pleasure to use. What should I look for in a contest logging program? First, be aware that logging programs come in two different flavours - general logging programs designed to maintain a normal station log, and specialized contest logging programs. The difference is that contest logging programs have contest scoring rules "built in" for major contests, so they will automatically keep track of your score, tell you whether you can work a particular station for the contest, and other contest-specific time saving features. Needless to say, you want a program designed for contest logging. Then make sure it supports the contests you want to enter, since having the contest programmed into the software for you is a real time saver. If you don't know exactly which contests you want to enter, then at least see how many contests it supports. Also consider the ease of adding new contests yourself if you have to. Some programs, like WriteLog for Windows, require programming skills to do this while with others, like TRLog, you can add new contests by editing a configuration file. Also look for a program that can interface with the rig(s) you use or are likely to use. Having the logging program automatically pick up the band and mode your rig is set to is a great time saver and eliminates a common source of costly errors. Many logging programs can also turn your beam automatically for you to point at the station you are working, so if you want to use this feature then make sure the program is compatible with the rotator(s) you are using. Finally, make absolutely sure that the logging program can export the log file in the standard "Cabrillo" format, which is used to submit logs for most contests. All decent logging programs can interface to your rig's key jack to send CW automatically. This is a great feature as it allows you to send exchanges while capturing information into the logging program. What is the "Cabrillo" log-file format? Cabrillo is a standard format for submitting log files to contest organizers so they can be checked and scored by computer. Although different logging programs store the log files in different formats, most have the ability to export to Cabrillo format for submission. How do I connect the computer to my rig? There are a couple reasons to connect your computer to your rig. First, so it can send CW automatically and/or PSK31 or RTTY depending on the contest. Some logging programs also provide a "voice keyer" which allows you to record messages and then replay them over the air. This is great for calling "CQ" in a phone contest, for example. For this you need a computer soundcard interface with support for CW keying. A simple example can be found on my web site. The second reason is so the logging program can keep track of the band and mode of your transceiver. This may require a proprietary interface from the transceiver manufacturer. Many of these interfaces will also allow the computer to control the transceiver, so for example you can change frequency simply by typing the new frequency on your computer. What sort of rig do I need to enter a contest? Just the rig you use every day. That's not to say that some rigs aren't better for contesting than others, but just about any rig will do to start. If you plan to buy a new rig for contesting, then look for one with a "strong" receiver which can receive weak signals in the presence of very strong signals without overloading. The "blocking dynamic range", "intermodulation dynamic range", "third order intercept" and "phase noise" specifications found in most technical reviews are important indicators of this. Also, note that it is a good idea to have your commonly used functions such as filter selections, if width and shift (if available), notch filter, attenuator, RF gain, mode, and band switch available on the front panel, to avoid having to wade through a menu system in the heat of battle. This means that the compact transceivers designed primarily for mobile operation may not be the best choice in a contest. The ability to interface the rig to your computer so the logger can automatically enter the correct band and mode is another useful feature that is found on most modern rigs. A narrow (250 or 500 Hz) filter is almost essential for CW contests. Amongst current production HF transceivers the Elecraft K2, Icom IC-756 Pro 2, Ten-Tec Orion and Yaesu Mk V FT-1000 MP are some of the best. However note that these are not beginner's radios (with the possible exception of the K2, but this must be constructed from a kit and so is best suited to someone with prior construction experience), so if you have no prior operating experience it may be better (not to mention cheaper) to start off with an entry-level or mid-range radio. There are also some excellent radios available at very reasonable prices second-hand, such as the ICOM IC-765, Kenwood TS-850S, Ten Tec Omni VI Plus and the Yaesu FT-990 as well as earlier versions of the FT-1000 (both the FT-1000D and the original 'MP are excellent radios) and the IC-756 Pro. Why do contesters only exchange reports and other numbers, not name and QTH? The object is to make as many QSOs as possible in a limited time, so "QSO rate" - the number of QSOs per hour - is (almost) everything. Hence all "unnecessary" parts of the QSO are omitted, leaving only the required essentials - call signs, 599 signal reports and a serial number or zone number if required by the rules. Be sure to check the rules to see what the required exchange is for each contest you enter. What should I do before a contest? Read the contest rules and decide which category you will enter. Test your station and antennas. Have a look at the expected propagation and draw up an operating schedule showing when you expect to operate on which bands, and where your beam will be pointing. (This schedule will change during the contest as conditions unfold, but you should at least have an initial plan.) Stock up on fast food - microwave meals are my favourite. Set up your computer, check that the logging program is interfacing with the PC correctly, and ensure that you select the right contest in the logging program. Try to get as much sleep before the contest starts as possible so you can work long hours during the contest itself. Feed your pets. Read the contest rules (again) and make sure you understand the exchange format, multipliers, sequence numbers, entry categories, power restrictions etc. Accurately set your computer clock so the QSOs will be logged at the correct time. What do I do after the contest? In order to be listed in the results, you will need to submit your log to the contest organizers. Most of the major contests these days prefer electronic logs, usually in Cabrillo format, as they can be automatically checked and scored. Smaller (e.g. national) contests may prefer paper logs. In most cases if you have not used computer logging then paper logs will be accepted. However many contests will not accept paper logs printed by a computer logging program. After all if you have the log on computer then they don't want to have to type it in again. The address for submitting your logs can be found in the contest rules. What should I not do after the contest? "Massaging your log" - for example, checking callsigns in a callsign database and then correcting those found to be in error - is generally frowned upon by contesters, although it may not be strictly illegal. What is a "busted call"? A "busted call" is a call which you captured incorrectly during the contest. You will generally lose points for busted calls or incorrectly logged serial numbers. What should I do if I'm not sure whether I copied a callsign correctly? If you are responding to a CQ, then wait for the station to call CQ again so you can copy the call correctly. If you are calling CQ, then send "CL?" and the other station will repeat his or her callsign. If conditions are poor, then you may have to ask a couple of times, but this is much better than getting the callsign wrong - which will cost you penalty points for the contest - or not entering the QSO in your log file, which is very unfair to the other station and will cost him or her penalty points. Note that although some programs (e.g. WriteLog) have the ability to mark a QSO as "unclaimed", the Cabrillo format used to submit contest entries has no such mechanism, so QSOs marked as "unclaimed" in the log file will just not be included in the Cabrillo file. It is very bad karma to do this unless you are absolutely sure that the other station knows they are not in your log, otherwise they might submit the QSO and be penalised for it. What are these unusual callsigns I hear in contests? You hear unusual callsigns during contests for two reasons. First, some administrations reserve special short or unusual callsign sequences specifically for use during contests. For example, in Britain callsigns with a single letter in the suffix like "M5A" or "GM1A" are reserved for contest use. In France, the prefix "TM" is allocated to contest stations rather than the more usual "F" prefix, for example "TM6X". A short callsign gives the station an advantage because it is faster to send and less likely to be copied incorrectly. Unusual prefixes are attractive because in some contests like the CQ Worldwide WPX (Worked all Prefixes) contest, each unique prefix counts as a multiplier, so the more unusual prefixes will attract more calls. That happens in other contests as well. The first time I heard a "TM" station I was convinced I had found some rare DX, and was somewhat disappointed when I discovered it was located in mainland France. Some countries have even issued callsigns without a digit following the national identifier. For example, the callsign "D4B" is issued by Cape Verde which has the national identifier "D4", so there is no digit following the national identifier - the "4" is part of the national identifier. However Article 19 of the ITU Radio Regulations was amended by the World Radio Conference 2003 (WRC-03) making it mandatory to have a digit following the national identifier, so it is likely that such callsigns will be phased out. Another reason for unusual prefixes is that many stations operate temporarily from a foreign country, usually to make themselves more sought after in the contest. For example, American stations are two a penny in most contests, but an American visiting the Bahamas is an attractive multiplier. Operators visiting a foreign country may be allocated a "normal" callsign for the country they are visiting, but will often use their home call either preceded or followed by the country (and possibly region) prefix of the country they are visiting. For example, KD4D operating from South Africa would use the callsign ZS/KD4D, while the same station operating from Canada would use a callsign like KD4D/VE3. Note that the Morse code for the "/" symbol is "dah-di-di-dah-dit", and it is pronounced "stroke" on phone. Unfortunately there is no standard as to whether the national identifier of the country being visited should precede or follow the home call. The CEPT agreement, which is the largest reciprocal licensing arrangement covering Europe, North America and some other countries, specifies that the national prefix should precede the home call. However other reciprocal agreements, like the one between the United States and Canada, specify that the national identifier should follow the home call and even within the CEPT agreement there is one exception (Peru). Also note that following WRC-03 it is now legal for amateur callsigns to have a suffix of up to four characters (even more for special event stations), and the suffix may use both letters and digits provided that the last character is a digit. So in future contests you may hear callsigns like "ZS1234A" or even "22222A"! The latter would be from Britain, which has been allocated the national prefix "2". So the best advice on callsigns is to expect the unexpected, and log each callsign exactly as received. Should I QSL my contest QSOs? If you are using Logbook of the World then by all means. If you are using QSL cards then this is likely to take a lot of time and money due to the number of contacts made in a contest. My policy is that in contests I only QSL on request, which normally means the other station sending me a direct QSL with a self-addressed envelope. This differs from my normal non-contest policy which is to QSL every contact via the bureau unless otherwise agreed. But whatever you decide, please don't enquire about QSLs on air during the contest. 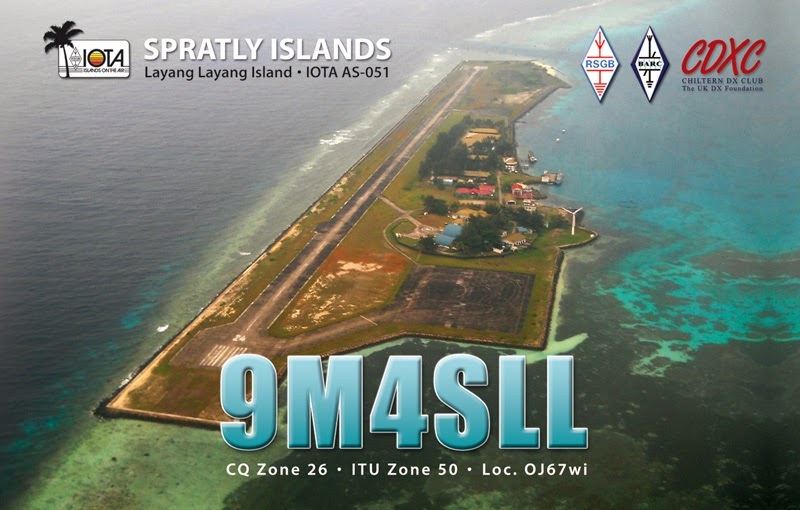 If you work a station you need, then QSL direct with a dollar bill or IRC after the contest.